Blog | Living With Fire | Helping Nevadans live more safely with the threat of fire. A pile of vegetation after a resident improved their defensible space. Photograph courtesy of University of Nevada Cooperative Extension. Jamie Roice-Gomes is the manager and outreach coordinator with University of Nevada Cooperative Extension’s Living with Fire Program. She earned her Bachelor of Science in Wildlife Ecology and Conservation and a Master of Arts in Interactive Environmental Journalism. She was a public relations assistant for Conrad Communications, a public information officer intern at the Nevada Department of Conservation & Natural Resources, and a Biological Science Technician at the USDA-Agriculture Research Service. She also enjoys volleyball, the Great Basin Desert and spending time with family. Contact Jamie at 775-336-0261 or [email protected]. Jamie Roice-Gomes is the manager and outreach coordinator with University of Nevada Cooperative Extension’s Living with Fire Program. She earned her Bachelor of Science in Wildlife Ecology and Conservation and a Master of Arts in Interactive Environmental Journalism. She was a public relations assistant for Conrad Communications, a public information officer intern at the Nevada Department of Conservation & Natural Resources, and a Biological Science Technician at the USDA-Agriculture Research Service. She also enjoys volleyball, the Great Basin Desert, and spending time with family. Contact Jamie at 775-336-0261 or [email protected]. For two years now, a community leader in my neighborhood and I have wanted to reduce the risk of wildfire in our community. The problem was that many of the residents in the area are seniors or are disabled and unable to perform the work themselves. Considering my neighborhood’s circumstances, we came up with some creative ways to physically remove and dispose of the hazardous fuels. First, let me explain the conditions of this community. I live in a development that was built during the late 1960s and early ‘70s and the neighborhood was landscaped with ornamental junipers. For those who don’t know, this was a popular shrub to plant at that time because it remained “green”, was drought tolerant and didn’t require much maintenance. Unfortunately, these shrubs are incredibly flammable. Over time, junipers can accumulate thick layers of dead plant debris that build up underneath the shrub. Junipers also have volatile oils which can cause the shrub to burn intensely once ignited. Ornamental junipers were usually planted right next to homes, putting them at risk of ignition as well. In addition to the flammable ornamental junipers, homes in my neighborhood are located on steep, inaccessible slopes that also have rabbit and sage brush, invasive weeds and rye grasses. After receiving defensible space inspections, my neighbors and I collaboratively decided to hire someone to perform work on a group of homes, which would be less costly per home than if we were to pay a contractor to perform work on only one house at a time. We decided to contract with the Nevada Division of Forestry’s Conservation Crews to remove the hazardous fuels and apply the defensible space inspection recommendations. The Conservation Camp Program consists of Nevada State Prison inmate crews who perform conservation-related activities including fire suppression. Thankfully we were able to get on their schedule to have work performed, and after three days, the work was completed. Next, we had to solve how and where to dispose of the junipers, shrubs and dried vegetation. One resident informed our group that Waste Management customers are allowed four trips per year to the transfer stations in the Reno or Lockwood Landfill at no additional cost. However, customers must provide their current waste management bill and a driver’s license to match the service address. During the month of May, there was also a “Junk the Junipers” event in Washoe County, where residents could dispose of their woody vegetation for free at two locations on a particular day during a specified time. Since there was no time limit on disposing green waste at Waste Management, most of the green waste was disposed of at the transfer station. Photograph courtesy of Cooperative Extension. Photograph courtesy of Sue Markert. A Photograph courtesy of Cooperative Extension. Though there are more neighbors to educate and more vegetation to be removed, these efforts are well worth the time and energy when we can see the effects in this instance. I hope that by sharing my neighborhood’s restraints and conditions, this might help other communities in Nevada to reduce the wildfire risk in their region. Keep in mind that not all communities in Nevada are the same (i.e. some fire protection districts or fire departments can help dispose of vegetation in different ways, or some waste management companies have different policies). Jam ie Roice-Gomes is the outreach coordinator with University of Nevada Cooperative Extension’s Living with Fire Program. She earned her Bachelor of Science in Wildlife Ecology and Conservation and a Master of Arts in Interactive Environmental Journalism. She was a public relations assistant for Conrad Communications, a public information officer intern at the Nevada Department of Conservation & Natural Resources, and a Biological Science Technician at the USDA-Agriculture Research Service. She also enjoys volleyball, the Great Basin Desert, and spending time with family. Contact Jamie at 775-336-0261 or [email protected]. Two things that I love are being active and experiencing the outdoors. 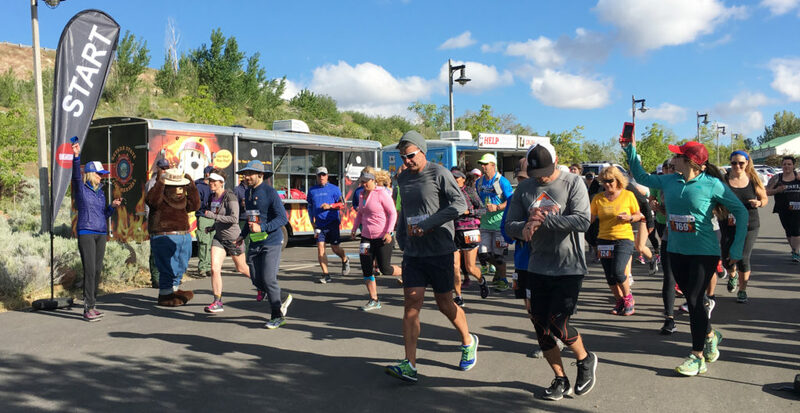 One event that combines both of these is to run a one-mile loop through the scenic Bartley Ranch while benefitting fallen firefighters. While I’m not a distance runner by any means, there’s an option to run or walk for a total of one hour that suits my needs. Collaboration among residents, and local, state and federal firefighting agencies. Photograph courtesy of University of Nevada Cooperative Extension. Cheatgrass emerging during the Fall.